It’s 2012, THE most important election year since the last election! Tonight I was fortunate to be able to attend an event hosted by one of the many people running for office in Oakland. Sean Sullivan (@seanforoakland) is hoping to be a member of the Oakland City Council, representing District 3 which includes West Oakland, Downtown, Adam’s Point and Lake Merritt. In an effort to get to know potential voters, he had an informational session at Inkwell, while showcasing local artists and helping to support an upcoming event for black nurses. Sean has been an activist in Oakland for over 10 years. He is a member of the Community Block Grant Board, a board member of Khadafy Washington Foundation for non-violence, and Oakland’s Community Action Partnership an organization dedicated towards reducing poverty. He also worked as an environmental health activist, advocating for such things as getting rid of BPA in sippy cups. 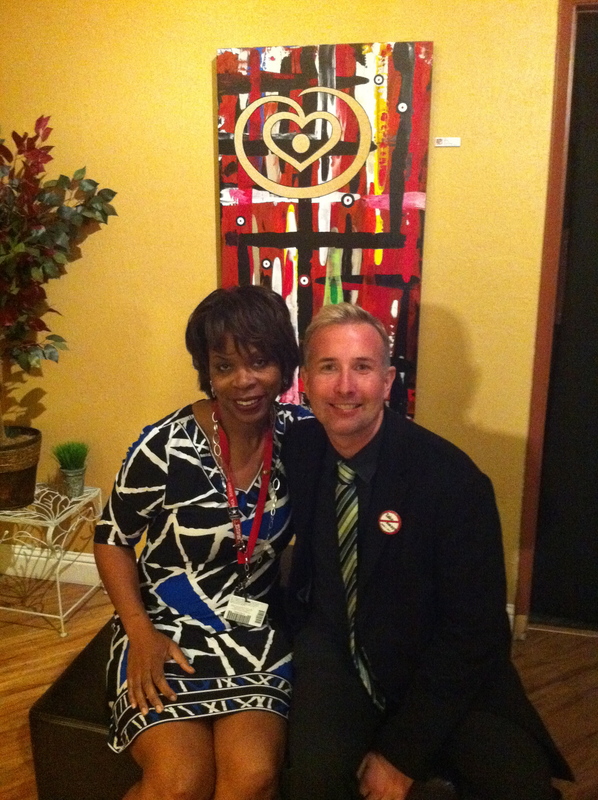 He is all about supporting small business, which he demonstrates by having tonight’s meet and greet at Inkwell. 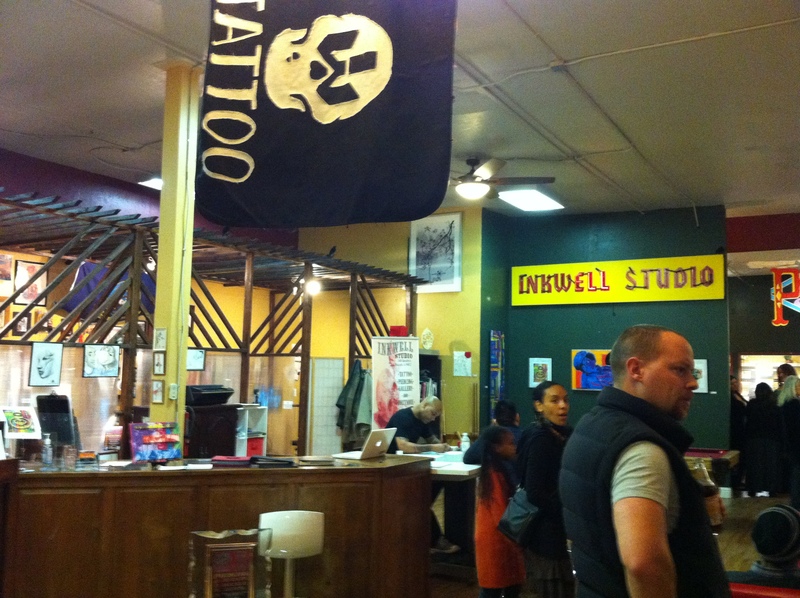 Inkwell Studio is a local tattoo, piercing and art gallery, located on the corner of 24th and Broadway in Downtown Oakland. 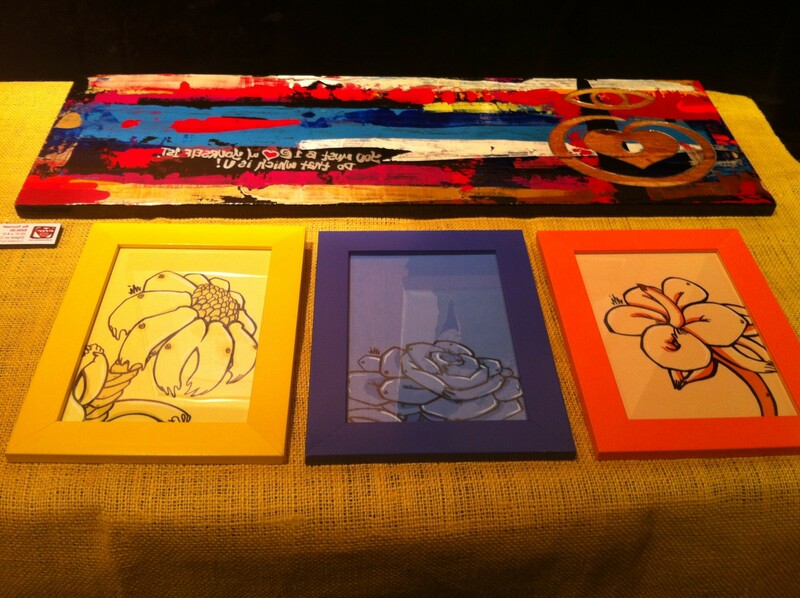 Not only do they offer custom tattoos and with exceptional customer service, they display art by local artists. Tonight they showcased a father and son team: Buggsy and Wade Malone. Buggsy is a Marine veteran who served in Iraq and Afghanistan. 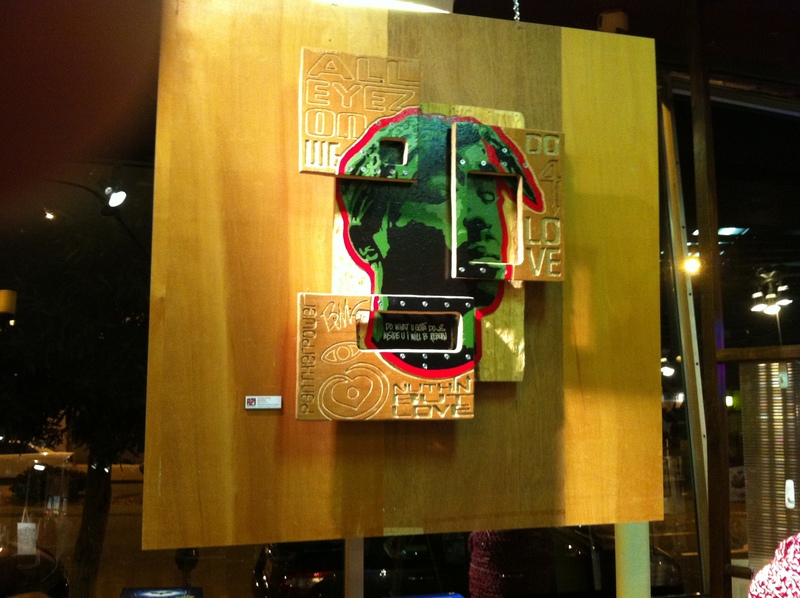 On display were some beautiful wood work of musical artists such as Tupac and Micheal Jackson. There even was a piece of work depicting Frida Khalo. Also on hand was a bay area nurse named Leslie Silket, RN, BSN. She was there to share information about the 2nd Annual Black Nurses Event. This is a special occasion to celebrate ‘unsung heroes’. Nurses, for little pay and sometimes no benefits, dedicate their lives towards taking care of patients. It’s not an easy job, and it’s sadly unappreciated. Silket says that this is a opportunity for local African-American nurses to get together and share their stories, celebrate triumphs and get a good meal! The Black Nurses event will be Z Cafe Feb. 16 at 5 pm. Tickets are $40, but if you are a student nurse you can get in for free. Email Leslie Silket, nuselove67@aol.com for more information. Sean Sullivan says that it is important to support local businesses because they provide employment to Oakland residents, and bring revenues back to the city. He is a huge supporter of risk takers and dream makers, and feels that small businesses like Inkwell and artists like Buggsy and Wade Malone are “hella cool!”. 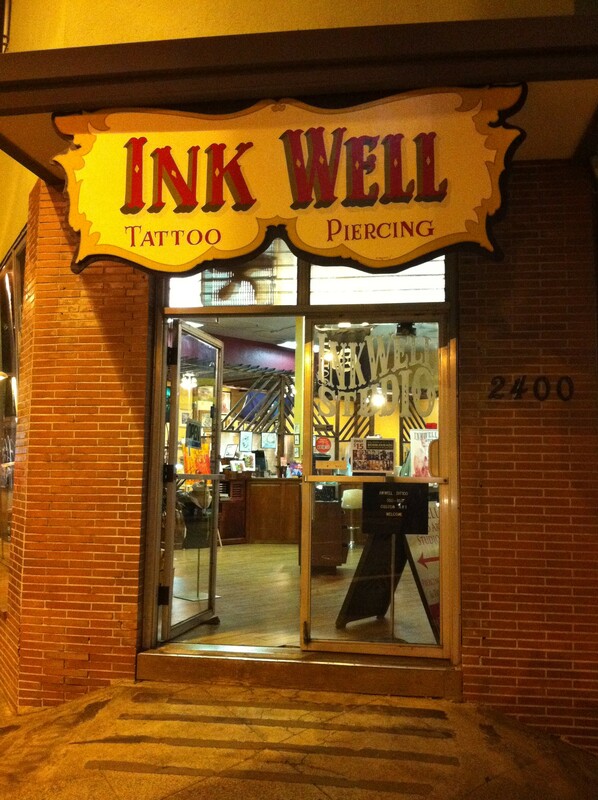 Visit Inkwell Studio all this month to see more work from Buggsy Malone and his son Wade. Support small business, local artists ..and don’t forget to vote! 2 Responses to Sean is for Oakland, small business and local artists. Thank you for coming out Tonya and sharing the Oakland love!